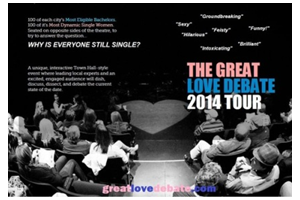 The Great Love Debate is Coming to Los Angeles! Hello Products in partnership with match.com, is proud to announce The Great Love Debate North American tour coming to the SilverScreen Theatre at The Pacific Design Center in West Hollywood, CA on Thursday, July 17th. The July 17th show continues the summer leg of a 45-city North American tour, and features a panel of the West Coast’s most prominent relationship specialists and influential voices including; Dr. Wendy Walsh, America’s Relationship Expert, Author, and Media Personality; Jonathon Aslay, Dating Relationship Expert for Women; Marni Battista, Renowned Relationship & Life Coach and Founder of Dating with Dignity. Adam Gilad, Author, Speaker, and Dating & Communication Expert Julie Ferman, “Master of Matchmaking, Coach and Consultant Laurel House, MTV Dating Expert and Author of Screwing the Rules Brian Howie, Top Women’s Specialist and Author of How to Find Love in 60 Seconds; and May Hui, Co-Founder and Personal Matchmaker, Catch Matchmaking. Tickets for the event are $40 and are available here. Doors open at 6:30pm for photos and a pre-show cocktail reception with live music, presented by Catch Matchmaking. Showtime is 7:30pm. Get your tickets early as seating is extremely limited (200 per gender). All attendees will receive admission to the “Meet, Greet, Mix, Mingle & Match” party which immediately follows the show, and features specialty cocktail creations from Wolfgang Puck and a live music performance from The Human Experience.